It is a cold windy day today in Oklahoma so I decided to stay indoors and cook. I wanted a food from my childhood. I loved cabbage when I was little. a bit strange but….. When I was growing up in that Northeastern state, these were present at weddings, fire company (hosey) picnics, church functions and family holidays. 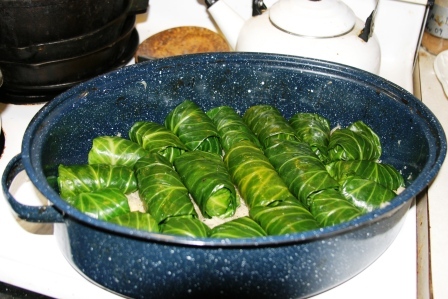 Called halupkies, cabbage rolls, stuffed cabbage, blind pigeons or Hunky Hand grenades, they were staples of Eastern European cooking. They are packed full of protein, whole grain goodness, Vitamin C and they are filling! I only use the dark green outer leaves of the cabbage head. They are easier to roll and have more nutrients than the pale inner leaves. You have to find these at farmer’s markets, in your own garden or possibly at the local store if you make friends with the produce manager. They do cut off the outer leaves before arranging in the produce section, so you can ask if they will either keep the leaves on the head or save the outer leaves for you. I have chickens so the local produce manager also keeps the produce and fruit cull for me. My hens are happy hens. In a medium size pot heat 2 cups of water. When it is boiling add the barley. Reduce heat and cook for 10 minutes. Remove from heat and fluff with a fork. Combine ground meat, cooked barley, onion, eggs, butter and seasonings. Set aside. On all of the cabbage, trim the center rib to about 1/8 inch thick so the leaves are easy to roll. Wash the leaves. While you are trimming and washing the leaves, heat salted water in a large stock pot until boiling. When the water is boiling, place the leaves in the water and blanch for 10 minutes. You may need to do this in several batches. When the time is up, remove leaves from water and allow to cool in a colander. Using a large turkey roaster, place a layer of 2 cans of sauerkraut. Take approximately 2 tablespoons of the meat mixture and shape into a little football. Select a cabbage leaf. Place the meat football on the leaf at the stem end and roll the cabbage leaf up like a Mexican burrito. 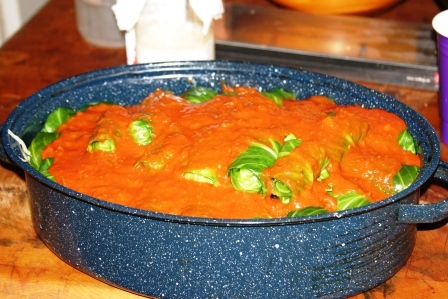 Arrange each cabbage roll in the roaster. When you have a full layer, top the rolls with 2 cans of sauerkraut. 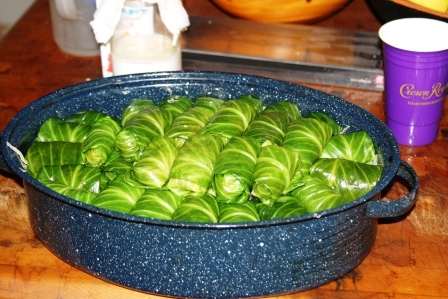 Arrange a second layer of cabbage rolls. Opps didn’t mean to have that Crown Royal product placement in there. Top that layer with 2 cans of diced tomatoes and a can of tomato sauce. Cover with roaster lid and bake 2 hours. Makes approximately 50 rolls. This entry was posted in main dish and tagged barley, beef, butter, cabbage, Eastern European cooking, onion, pork, venison, whole grain. Bookmark the permalink. Oh yes, they are so yummy.